This is a Crumple-Horned Snorkack. Isn't it lovely? Clearly, only God's hand could make such a beautiful creature. Surely no human being could conceive of such a thing. OK, so maybe God had a little help from a human being armed with the GIMP and a picture of a Blackbuck antelope that he found on the Web. I'm posting the Snorkack to introduce a trend I've noticed, which is fast becoming a peeve of mine. That is, obviously Photoshopped images -- many of which are exceedingly badly done -- which are posted as evidence of God's divine hand. And let me be clear that I'm not peeved at the people who re-post these images. They're just passing on what they got from a source they trusted. I'm not necessarily peeved at the ones who made the images... after all, I just made a Snorkack. I am peeved at the ones who pass these off as glorious nature, because they're liars. If you're doing this, you're not being clever. We know there are gullible people. We know there are people who know nothing of astronomy or meteorology, or biology. You don't get points for taking candy from a baby. You might have gotten points for helping to educate them, but you missed out. This one was labeled "This is a rare Albino Bald Eagle". Uhm.... no, it's not. But that's not so bad, all things considered, as at least it's not a Photoshopped image. 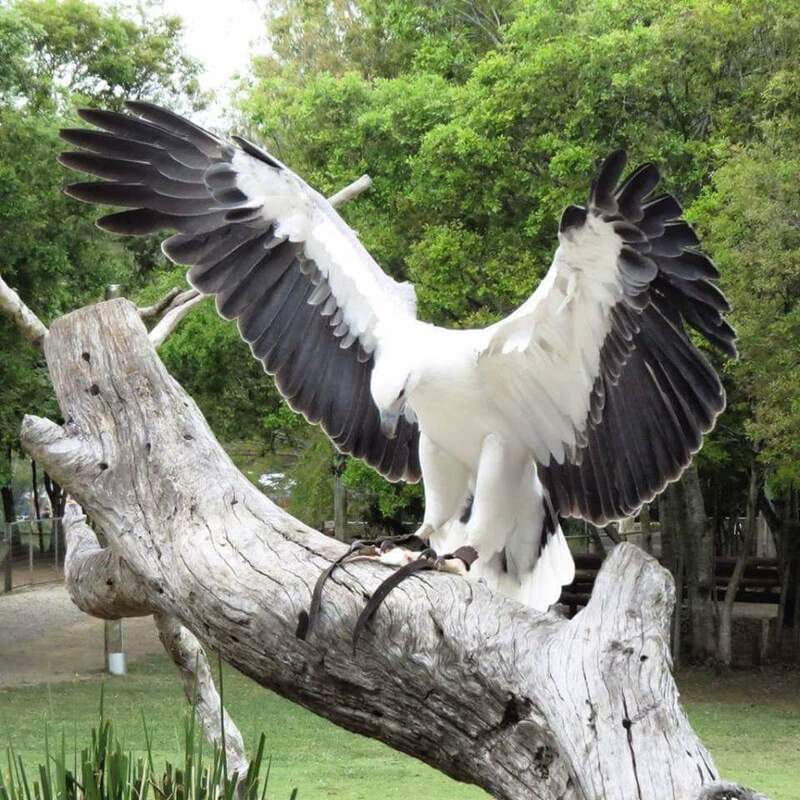 The striking, regular pattern of black feathers, as well as the color of the legs, beak, and eyes tip you off that this isn't an albino anything... not even leucistic. It's just mis-identified. It's a white-bellied sea eagle, which is indigenous to Australia and the South Pacific. Its conservation status is "least concern". And it's not particularly "rare", either. There are something between 10 thousand and 100 thousand of them in the wild. But it is a beautiful animal. 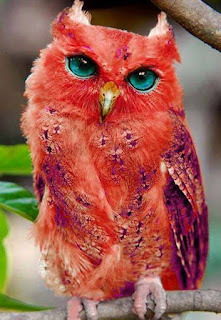 The image on the left was posted with the caption, "Very Rare Red Owl, only God's hand can create such amazing unique beauty." Well, no. Again, this is a very human hand, armed with a copy of Photoshop and an image from the Web. 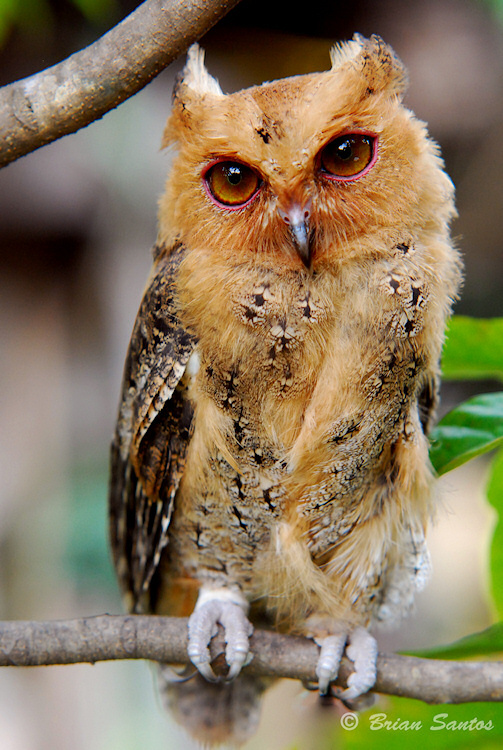 This Furby wannabe is a carefully cropped and re-colored image of a Philippine Scops Owl. The original picture is on the right. It's by Brian Santos, and was found on the Owl Pages website. I'm hoping Mr. Santos doesn't mind my use of the image for the purpose of editorial comment and to restore credit where it's due. You'll notice that the doctored image was carefully cropped to remove the copyright notice. The image bugs me, not only because Santos' copyright was removed, and not only because it was colored, but because someone thinks that this DayGlo® monstrosity is an improvement over the tasteful blonde natural coloration of the bird. And by saying "..only God's hand..." the hoaxer tells us everything about his opinion of himself. It shouldn't surprise you that I disagree vehemently. The Moon is upside down. 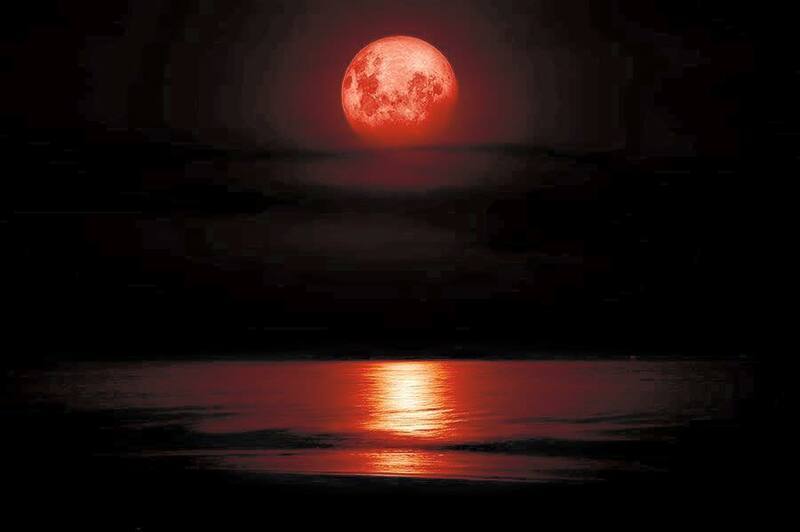 This image was taken through a telescope, not a camera, and the horizon was put in later. The color banding is horrendous. 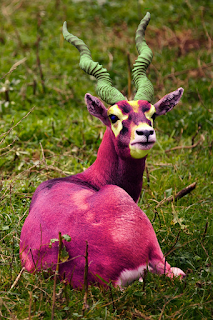 It's indicative of severe color manipulation. This is possibly a sunrise, tinted and darkened considerably. ...the Moon is in the wrong place. On September 27 in Charleston, SC the eclipse started around 8p.m., but the eclipse wasn't total until about 10pm, which is when it would be seen as a "blood moon". Well, at that time the Moon over Charleston was significantly higher in the sky. Based on the size of the disk, this image depicts a Moon that's maybe 2° over the horizon. The actual Moon was at around 39° at the time. An image like this is just a Photoshopped image... until you put a time and date on it, and claim it's an event. Then it's a fraud. This image is a fraud. 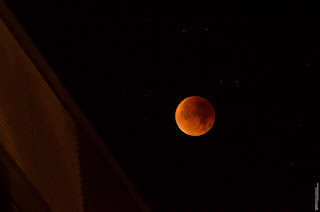 Here's what the Super Blood Moon actually looked like from a cloudless venue that night. This was taken by Max Grobecker in Wuppertal, Germany. Note the high angle over the building. (about 26° according to Stellarium) Note the orientation of the Moon's markings. Note the gradation of the color, as the Moon moved along the edge of the Earth's umbra. Note the natural coloration that wasn't filtered or manipulated. Again, I'm not particularly bothered by the people oohing and aahing over doctored images. They don't know better. I am bothered by the liars and frauds who present them as real. 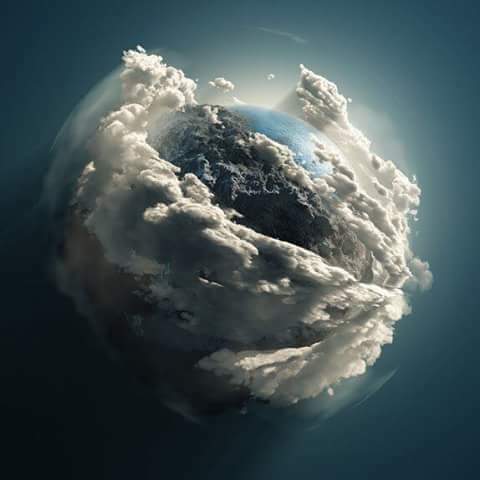 The accompanying text is typically, "A phenomenal photograph of our home cradled by clouds, from the Hubble telescope." NO. IT'S NOT. First of all, the Hubble doesn't point at the Earth, and even if it did, it only takes long exposures and the Earth would wind up streaky. Also the scale is very much off. As art it's nice, as a photo manipulation it's clever, but as "from Hubble" it's a fraud. A beautiful fraud, but still. 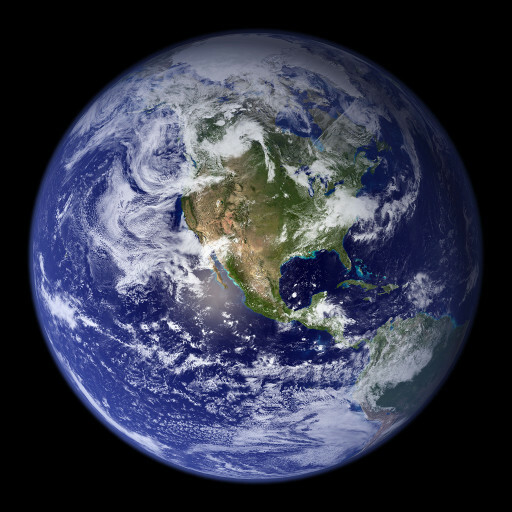 This was taken from the Deep Space Climate Observatory, from a million miles away. It's the first picture of the entire sunlit side of the planet. See how tightly the atmosphere hugs the Earth? And the clouds are well below its limits. It may not be as poetic an image, but it's real. DayGlo is a registered trademark of the Day-Glo Color Corp... the world's largest manufacturer of horrendous, mind-battering fluorescent hues. Thanks for the clarification; I've corrected the text. And thank you for making the image available under a Creative Commons license. It's an excellent photo.